Even in broad daylight, the recessed black door on the north side of Montpelier's Main Street opens to darkness. But when you step into the brick stairwell and ascend the narrow staircase toward filigree lanterns, the red lights guide you to the landing, where a host greets you with a smile. Behind her stands a bar, trimmed in stained glass, and behind that, a black-clad barmaid. She furnishes the drinks for La Puerta Negra, the new restaurant and lounge-y nightclub that opened inside the former Black Door Bar & Bistro in early July. New owner and Positive Pie co-owner Carlo Rovetto kept the old digs mostly intact. 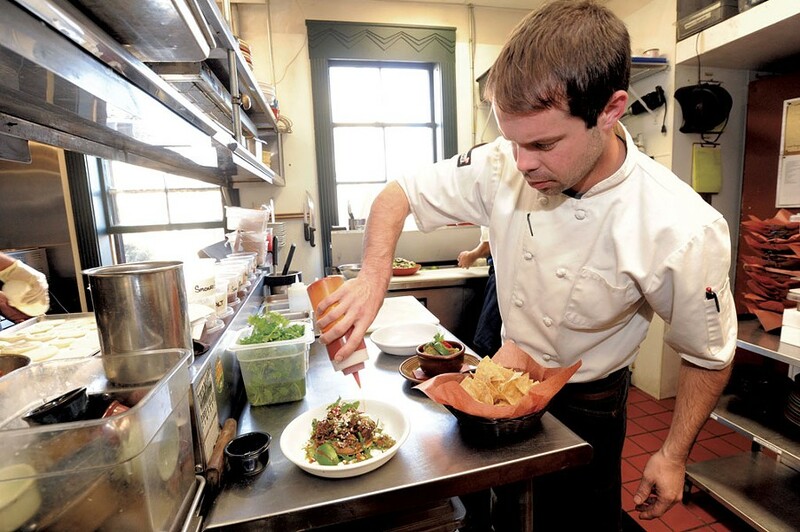 He seems to have handed control to general manager Xavier Jimenez — who, along with Knayte Lander, bought Buch Spieler Records last spring — and executive chef Jean-Luc Matecat. 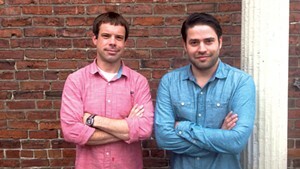 The project is separate from Rovetto's several pizza joints, and from the RBI Restaurant Group that manages them. By day and weeknight, La Puerta Negra is a Latin American restaurant; on Fridays, the third-floor lounge hosts live music. Other nights bring comedy and other cultural arts. From the bar, the dining room spreads out in nooks and alcoves: a banquette along the wall; clustered tables tucked beneath bricked arches; and 19th-century iron accents that, with salsa and merengue music played at a certain volume, could conjure colonial Mexico. It's a charming space, and the restaurant's 75 seats have been full nearly every night since it opened. So full, in fact, that management had to remove several tables to lessen the glut. That probably explains why the waitstaff — some of whom seem a bit clueless about the basic logistics of eating out — are eager to take drink orders the moment you're seated, but liable to go AWOL for whole half hours. Luckily, there are enough servers that someone is always available should you need another round. 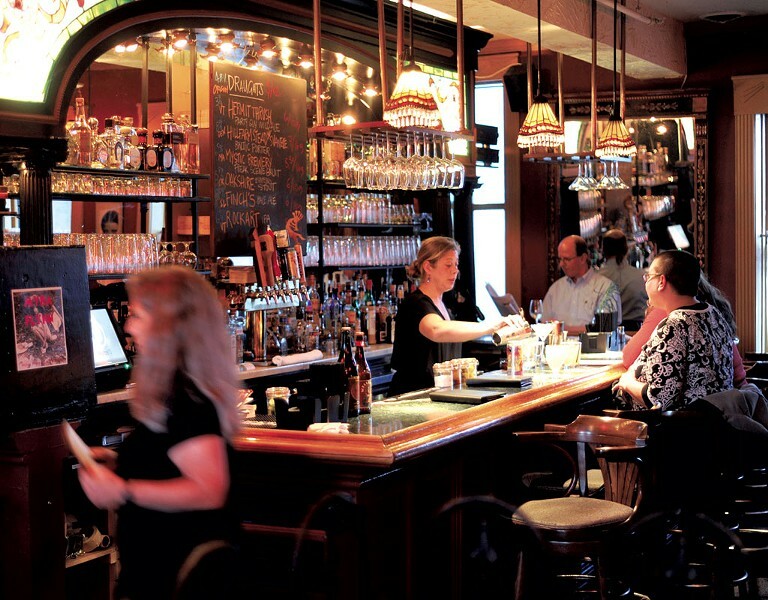 Jimenez stocks his bar with a handful of beers — not Vermont's usual flagships or many big IPAs. These might include sours from Hermit Thrush Brewery, pale ales from Maine's Oxbow brewery or Hill Farmstead Brewery's creamy, sea-black Baltic porter, along with several specialty bottles. But in keeping with the venue's Prohibition-era vibe, the bar revolves around harder stuff. Its 60-odd bottles of mezcal and tequila represent one of Vermont's finest agave collections, and Jimenez puts tropical New World spirits to work on his cocktail list. Sipped on the deck in the light of a setting sun, the house margarita was a slow-burning tart of a cocktail, all lime and cactus, sweetened with a touch of raw sugar. But I was more taken with the sweeter Fuego marg's habanero singe. Pirates may prefer the Puesta del Sol, a rummy take on the tequila sunrise, with pineapple, citrus and a pink splash of pomegranate. The pisco sour was conspicuously absent from the list (I asked for it, to no avail). But pisco — Peru's tetchy grape distillate — appeared in the juicy, vaguely herbal Pisco Passion, while Brazilian cane-sugar cachaça stiffened a tart, dry Caipirinha. Poured into cups brimming with ice, these drinks go down quickly. But at $8-12, it seemed worthwhile to drink more than one. You would if you were in Latin America, and comparable craft cocktails often fetch $15 or more elsewhere in Vermont. After leaving the Inn at Weathersfield last year, Matecat kind of fell off the map for a while. 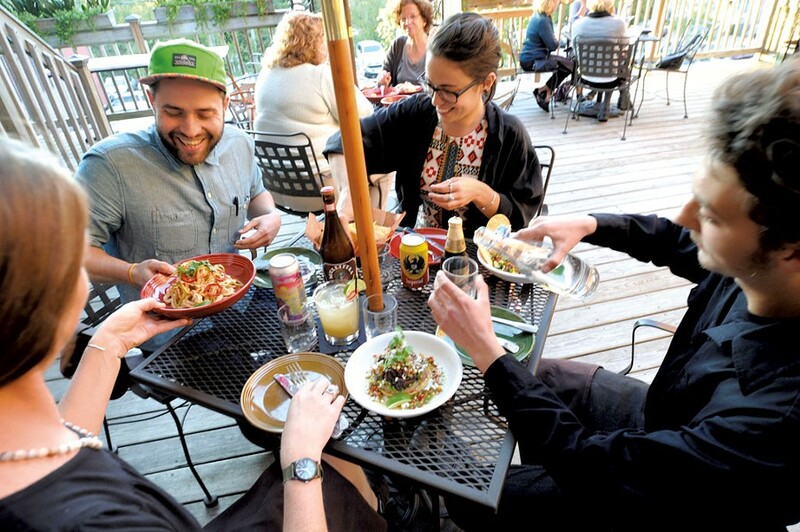 In Montpelier, he has moved away from the inn's formal, composed cuisine and embraced the free-form Latin American style, in which plates are not so much styled as piled. That works in the case of chilaquiles, a homespun Mexican dish that soaks yesterday's corn tortillas in mole or chili with cheese and whatever else. Matecat's green version came smothered in a verdant tomatillo salsa with ripe avocado, black beans and a yolky farm egg. The dish was humble and comforting and succeeded precisely because of its lack of fuss. In fact, many La Puerta Negra standouts are streamlined and simple. One night, our yucca fries, served with lustrous, chipotle-tinged aioli, were so starched and crisp outside, and so smooth and creamy inside, that it seemed they'd been breaded before frying. Nice touch, I thought, somewhat incredulous at the assumed embellishment. But no, the "breading" was all technique. Matecat soft-boiled the roots, then fried them until the wetted starches congealed into a brittle crust, giving uncommon sheen to the common street food. 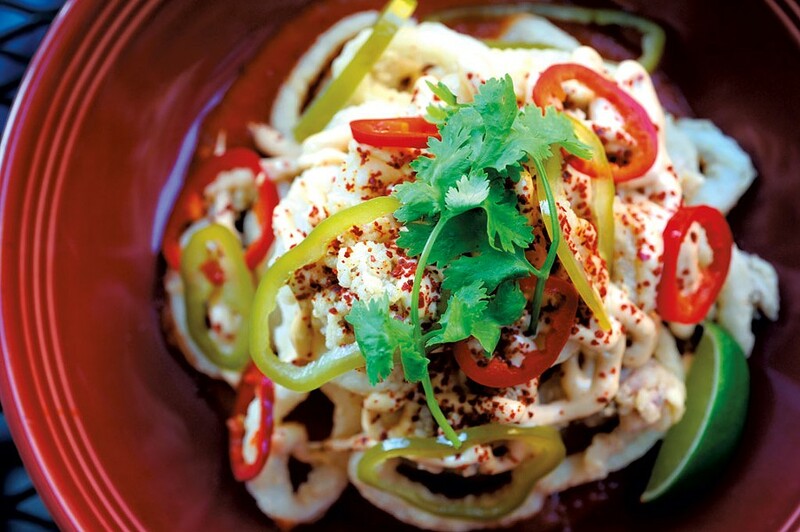 A tumble of squid Veracruz — served over aioli with pickled chiles and red pepper sofrito — owed its crispiness to a quick crusting of masa harina. Though a tad chewy, the squid's flavor was good. Other successes emerged in the details: tortilla chips that shattered in clean, crunchy lines; spot-on guacamole mashed moments before it hit the table; smooth, rust-brown mole that filled the room with its peppery, cocoa-rich bouquet. Matecat's grilled corn on the cob was an able proxy for the typical ears served in plazas and bus stops throughout Central and South America. Its explosive, sweet kernels were mere punctuation for the slathered sour crema, crumbled queso blanco, and smoky scattering of sumac and Aleppo pepper. The corn's many accoutrements made for sloppy, finger-licking fun, but elsewhere on the menu, sauces, creams, chiles and herbs overwhelmed the chef's meticulous attention to craft and alchemical flavor assemblages. In his update of the traditional Mexican pit-roasted chicken pibil, Matecat braised bone-in thighs in sour orange and vegetables to a delicate tang. But, buried in beans, crema and peppy pico de gallo, the meat could have been the same basic grilled chicken found in trendy cantinas from Boston to Atlanta. In the tacos al pastor, hearty hunks of grilled pineapple, sweet roasted onions and heaps of cilantro railroaded the thin-shaved, chile-marinated pork. 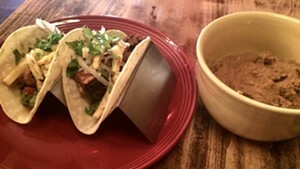 For the tacos de lengua, the chef soaked the beef tongue in strong onion marinade, then smoked and braised the meat before dicing it for tacos. There are many ways to showcase tongue's springy, smooth-muscled texture, but the chunky dice didn't fit in — even in the company of julienned radishes, sweet onion, chiles and salsa verde. This is not to say the tacos weren't tasty — all were better than most of their ilk in Vermont. Matecat uses high-end, GMO- and antibiotic-free New England meats (sourcing closer to home would blow the restaurant's price point, which lists apps between $5 and $12 and entrées from $15 to $20), and the fine ingredients give the menu a sturdy backbone. But since this chef — who is widely recognized for his talent and culinary ambition — spends days on elaborate, multistep preparations, it would be nice to hear his voice, as it were, louder and clearer. Then again, maybe the kitchen is already headed in that direction, testing potential new dishes as specials. "Specials? Oh, yeah!" chirped our waitress when I asked about menu additions. 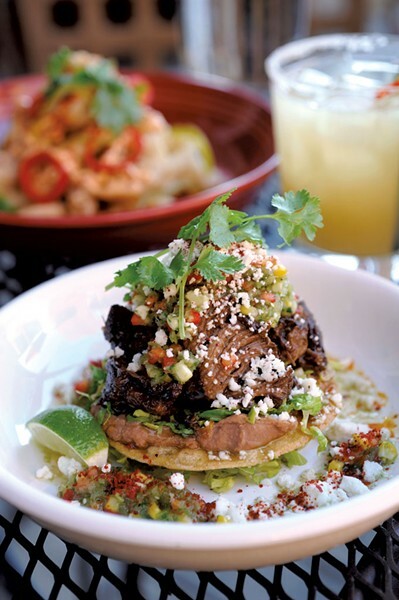 My prying produced a tamarind-braised beef-shank tostada, which was the crown jewel of my two visits. Perched on a crunchy tortilla over velvety refried beans, the tamarind's fruity molasses funk enlivened the beef, flooding the senses with roasty Latin love. The poblano-tomatillo relish and bits of white cheese only elevated the dish. In this age of gastropubs and fast-casual chains, few restaurants dare to ask diners along for an experience. But with its steep, tunneled entry, bricked interior and back deck offering voyeuristic views into the upstairs apartment, La Puerta Negra seems poised to treat its guests to a transpotative dinner charade. It certainly does so in the intimate upstairs lounge, where live jazz takes on Latin beats, drinks taste stronger and laughs come easier, several stories above the sleepy nighttime streets. But the restaurant, with its bubbly staff who may forget portions of your order, hasn't quite mastered the loose, conspiratorial hush that defines speakeasy dining. Then again, maybe the place is only now growing into itself, just three months in business. Last week, as my tablemates sipped an elegant imperial brown ale from Foley Brothers Brewing at meal's end, and the restaurant emptied around us, the service felt smoother and more refined than earlier in the evening. In the post-sunset quiet we savored tart, candied spoonfuls of passionfruit mousse, calmed by a touch of mint chiffonade and barely sweet whipped cream. How often do you have passionfruit? I asked myself, swirling the silken cream around my tongue. Not nearly often enough, my dessert seemed to reply, with a snicker. The original print version of this article was headlined "Covert Cantina"